HARTFORD - There were times when the UConn women’s basketball team had to work to fill out its non-league schedule. The Huskies’ 2019-20 non-league slate is complete and they are well on their way to filling out the non-league schedule for the 2020-21 campaign. The latest additions are former foes Maryland and Texas. UConn will host the Terrapins and the Longhorns in 2020-21 and make trips to College Park and Austin the following year. 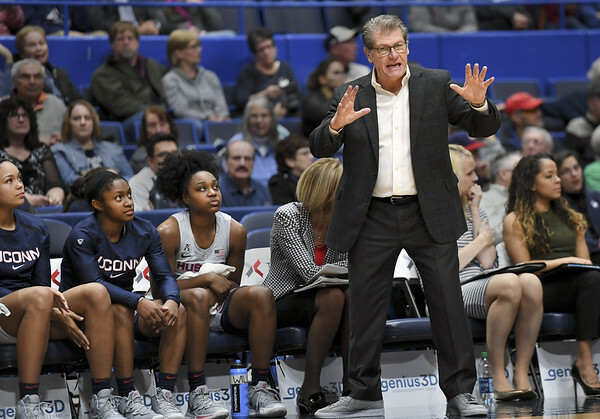 “Our schedules keep getting tougher, tougher, and tougher, and they’ve been among the toughest over the last 10-15 years,” UConn coach Geno Auriemma said Wednesday after his team blasted East Carolina 118-55 at the XL Center. “I don’t know if people around the country sense ‘This is the right time to get them,’ but it seems like there’s no one that we’re not playing. It’s incredible. UConn completed series with Maryland and Texas a year ago. The Huskies are 7-0 against the Terrapins, and have beaten the Longhorns in all eight meetings. For 2020-21, UConn has so far signed deals to host Arkansas-Little Rock, Dayton, Maryland, and Texas, and visit Baylor, Cal, Oklahoma, Tennessee, and Virginia. “The teams we play, we know what’s going to happen when we walk into their gyms,” Auriemma said. “But we want to put ourselves in that position as much as possible and you can’t have it both ways. That’s the cool thing about it. Posted in Newington Town Crier, UConn on Thursday, 7 February 2019 21:21. Updated: Thursday, 7 February 2019 21:24.